Find your selection fo camisole, tops or T-shirts from big brands of lingerie like OSCALITO, MORETTA, LISE CHARMEL and BARBARA. Tops, t-shirts, camisoles There are 157 products. This Oscalito V COLLAR top is entirely made in Italy. The Sloggi camisole from the S by Sloggi - S Serenity collection is a fine strapless design with integrated ampliform cups. It is a practical 2 in 1 lingerie piece for every day. Thanks to its silky and ultra light material, this caraco will accompany you with gentleness on a daily basis. Cups : B to C.
This T-shirt is in 100% thread of Scotland and offers refined small lacework in Leavers. 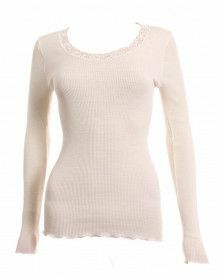 This soft Oscalito top offers a refined and elegant piping in lace. Ghiaccio color. The universe of top, tee-shirt and camisole Mesdessous.fr are pieces of lingerie that can be worn in underwear as in ready to wear. We have selected for you sharp brands that offer materials of exceptional quality and modern. We offer wool and silk underwear mainly from Italian brands such as OSCALITO and MORETTA.